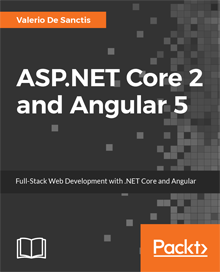 The video-course is about 3 hours long and has been elaborated on the basis of the first 6 chapters of the book, showing how to realize a working demo of a Single-Page Application built upon a solid ASP.NET Core 2 MVC API back-end ,an Angular 5 front-end and a Data Model powered by Entity Framework Core. The various sections are implemented by making use of a Full-Stack Development approach. Before answering the question, we should understand what we really meant when we said “being able to”. We don’t have to become experts on every single layer of the stack; no one expects us to do so. When we choose to embrace the full-stack approach, what we really need to do is to raise our awareness level throughout the whole stack we’re working on; it means that we need to know how the backend works and how it can and will be connected to the frontend. We need to know how the data will be stored, retrieved, and then served through the client; we need to acknowledge the interactions we will need to layer out between the various components that our web application is made of, and we need to be aware of security concerns, authentication mechanisms, optimization strategies, load-balancing techniques, and so on. This doesn’t necessarily mean that we have to have strong skills in all these areas; as a matter of fact, we hardly ever will. Nonetheless, if we want to pursue a full-stack approach, we need to understand the meaning, role, and scope of any of them, and possibly, be able to work there whenever we need to. Special thanks to those who’ll support us purchasing the video, which is now available at the promotional price of € 10.24 for the first 48 hours!